If you live in a house with a garden, you should be careful about the aspect of your lawn. If not properly cared for, a garden tends to transform into an uncultivated jungle or into an arid desert. But in addition to learning how to cultivate and grow flowers and plants, you should also keep clean and neat the grass. Therefore, a lawn mower is an essential tool to have in your shed. This tool will allow you to maintain the beauty of your lawn by cutting the grass to the desired height and by keeping your garden decent at all times. There are many lawn mower types available on the market, but one of the most efficient is probably the electric lawn mower. Today, we’re going to speak about this tool and we also prepared a list of the best electric lawn mower reviews to help you choose the right tool for your lawn. An electric lawn mower is a product of the technology, an equipment designed to help you mow your lawn faster and to ensure that you will achieve excellent results that are worthy of the best gardeners. The electric lawn mowers are excellent devices capable of cutting the grass easy and precisely. These tools are ideal for the maintenance of small or medium-sized gardens. Functioning with electric current, these devices require access to an electric outlet, and this might be an issue for larger lawns. However, with an extension cord, you should be able to use an electric lawn mower for all types of gardens. To compensate this inconvenience is the reduced dimension of these mowers compared to the gasoline mowers. These devices are also more lightweight and more silent, are much easier to use and are egregious regarding quality, efficiency, and price. The electric lawn mowers are also ideal for those who don’t have a lot of experience in garden maintenance, or for the experts seeking for an ergonomic version of the heavier and bulkier gasoline lawn mowers. Typically, the electric lawn mower is a mower that must be pushed by hand. Most of the electric mower models available on the market have adjustable handles, and in this way, you will be able to feel comfortable throughout the mowing process. As the name suggests, these tools are powered by electricity. However, it is quite hard to find a mower with a long enough power cord. In consequence, when you decide to buy an electric lawn mower, you should be aware that you will also have to purchase an extension cord that will allow you to use the mower even in the most remote corners of your lawn. There are some cordless lawn mower models available, but keep in mind that the batteries have limited autonomy. Since running out of power in the middle on the mowing process can be quite frustrating, we believe that a traditional electric ﻿﻿lawn mower is a more convenient choice. Despite this minor inconvenience, the electric mowers present many advantages. The level of noise is really low, which makes them more pleasant to use, both for you and for your neighbors. Are ecologic, since they don’t use any type of gasoline or other fuel. The footprint of an electric lawn ﻿﻿﻿mower is generally small, so the occupied space during storage is limited. However, pay attention to store the mower in a closed space away from agents that might damage it, such as humidity. One of the main features searched in any lawn mower is the possibility of adjusting the height of the cut. Therefore, before deciding which is the best electric lawn mower for your garden, make sure to check if the height of the blades can be adjusted. Typically, the ideal height of the grass varies from 1” to about 2-2.5”, depending on the type of grass. For this reason, many manufacturers equipped their mowers with blades that can be adjusted at preset cutting heights. However, make sure that the mechanism that allows you to change the height of the cut is simple. Ideally, you should be able to adjust the height of the blade by operating a lever. You might think that it is simple to buy an electric lawn mower, but there are many aspects to consider before making a purchase. The choice of a lawn mower should be primarily dictated by the lawn’s characteristics, such as surface, soil characteristics, what type of lawn you have, if it is a transition zone or not, and so on. The price shouldn’t be the main decision factor in this case, and you should see the lawn mower as a long-term investment. As we said before, an essential characteristic of a good lawn mower is the possibility of adjusting the height of the cut. In addition, you should also be concerned about the options to collect the cut grass. Ideally, you should choose an electric lawn more equipped with a grass collection container or bag. The plastic containers are generally attached to the mower and can be removed for cleaning and emptying purposes. The collection bags, on the other hand, must be positioned on the mower before starting the mowing process. They are easy to use and many users prefer them to the fixed plastic containers. However, the bags present the disadvantage of having smaller collection capacities compared to the plastic containers.The length of the power cord is also decisive. Depending on the size of your lawn, you should choose a model with a long power cord or think about purchasing an additional extension cord. The best thing to do if you want to determine if you need a power extension cord is to measure the distance between the electric outlet and the most remote corner of your garden to see if the mower’s power cord is long enough or not. On the market, there are available alternative models of lawn mowers, powered by gasoline or by batteries. The gasoline mowers have been popular over the years, but they are not environmental friendly, produce a lot of toxic gasses, and are noisy, heavy and bulky. You will also have the hassle of buying the fuel needed to power the mower. In fact, the storage of the gasoline is one of the main hazards posed by this type of mowers, especially if you have small children. The cordless electrical lawn mowers are powered by rechargeable batteries. Similar to the electric lawn mowers, these are environmentally friendly and present the advantage of being cordless. The only downside of these mowers is the duration of the charge, which might not be sufficient to ensure a continuous work. For this reason, you will have to either mow the lawn in various sessions or buy additional batteries. However, the batteries can be rather expensive and they have a limited lifespan. An electric lawn mower is simple and easy to use. However, some precautions must be taken. First of all, remember that we’re talking about an electric tool, therefore you shouldn’t use it in the presence of water. For this reason, it is not advisable to use the mower during or shortly after a rain. Also, if you need to water the grass, it is advisable to do it after you put the lawn mower away. You should also clean the mower immediately after you finished mowing. You should clean the blade from any residue and you should also empty the grass collection container or bag. The grass is generally highly corrosive, so it could ruin the mower’s blade and damage the container. Also, make sure to store the mower in a dry shed. Check the state of the blade, power cord and switches regularly, to make sure that nothing is damaged and that you can enjoy the benefits of this tool for a long time. That being said, you’re probably wondering which electric lawn mower to buy. Below is a list of the five best electric lawn mower reviews. Check their features and choose the best electric mower for your lawn. One of the most popular electric lawn mowers is this GreenWorks 25142 10 Amp 16-Inch Corded Lawn Mower. 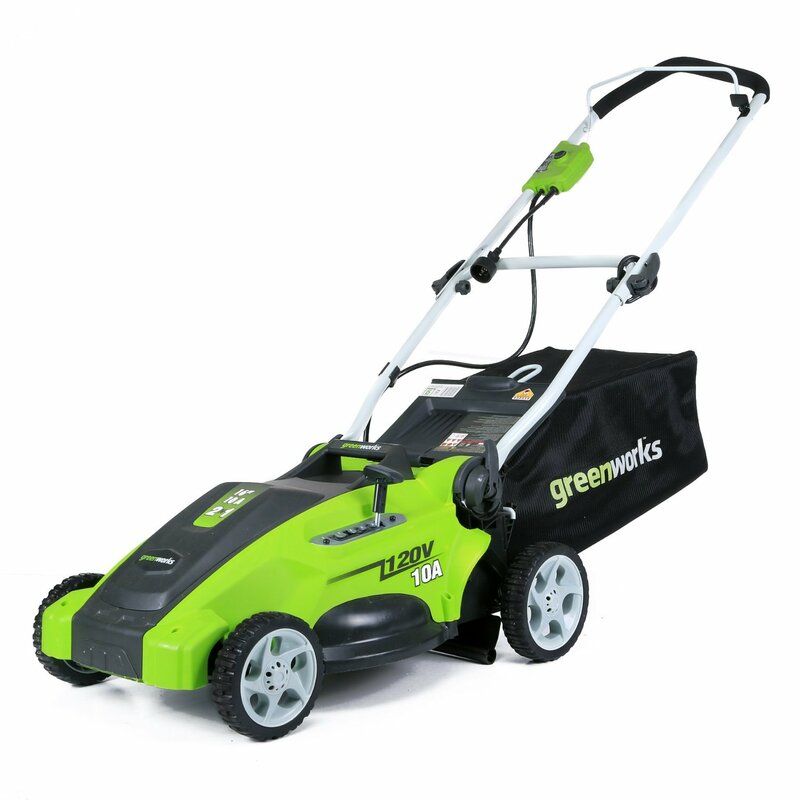 Manufactured by the established brand GreenWorks, this lawn mower is compact, powerful and perfect for small or medium-sized lawns. In fact, this sleek lawn mower was designed especially to fit in the narrow spaces, boasting a 16-inch cutting deck. This electric lawn mower boasts 5-height adjustable blades and a 2-in-1 function for rear bagging and mulching. The adjustment of the blade can be made by operating a lever. In addition, this tool is lightweight and can be easily maneuvered. Easy to start: the GreenWorks 25142 10 Amp 16-Inch Corded Lawn Mower can be started easily by pushing the start button. It doesn’t have a safety button, though. Foldable handle: for easier storage, the handle of this lawn mower is completely foldable. Compact: this lawn mower is one of the most compact mowing tools available on the market, being perfect especially if your garden is narrow. Powerful: this mower boasts a powerful 10 Amp motor and can efficiently cut through any type of grass. In addition, the mower is fairly silent and doesn’t vibrate much. This lawn mower is not really suitable for larger lawns because of its compact dimensions and small capacity of the collection bag. From the same manufacturer,GreenWorks, comes this highly appreciated lawn mower that is more powerful and wider than its 25142 counterpart. This lawn mower is suitable for small and medium-sized lawn and fits perfectly into tight spaces thanks to its 18-inch cutting deck made of durable steel. The mower boasts a 12 Amp motor that is powerful enough to ensure an efficient cutting through any type of grass and has a seven-position cutting height adjustment. Similar to the 25142, the GreenWorks 25012 12 Amp Corded 18-Inch Lawn Mower also features a 2-in-1 function of mulching or side discharge. The 7-inch wheels, together with the low weight, make this mower easily maneuverable on any type of terrain and in narrow spaces. 7 cutting heights: perfect for any type of lawn, this mower allows you to adjust the cutting height to 7 various dimensions. 4-year warranty: GreenWorks offers a 4-year limited warranty for the parts and labor. Cost-effective: being an electrical lawn mower, you will be able to cut off the costs of fuel or battery replacement. Easy to operate and handle: the mower can be easily started with the push of a button, while the dimensions and weight make it very easy to handle. The manufacturer doesn’t give clear instructions about the way you should use the electric cord. Famous all over the world for its powerful tools, Black & Decker is a manufacturer that doesn’t need an introduction. Nor its Black & Decker MM2000 13 Amp Corded Mower, 20-Inch, a tool designed to make lawn mowing an easy operation. This tool has a simple functionality, it can be successfully used for any type of lawn and for any type of grass, is silent and boasts a powerful 13 Amp motor. To make it an excellent tool are also the 20-inch cutting deck and the adjustable cutting height. This lawn mower has a 3-in-1 function of mulch, side discharge or bag, so you will have plenty of options to choose from. Its compact and foldable design makes it easy to maneuver and also easy to store when not in use. The attractive price is another big plus of this fantastic tool. Easy to use: this electric lawn mower is very easy to operate. It starts with the push of a button, while the blade can be easily adjusted by operating a lever. 13-gallon collection bag: this mower comes with a 13-gallon grass collection bag made of nylon, so you will be able to check the fill level easily. Convenient carrying handle: the Black & Decker MM2000 13 Amp Corded Mower is easy to transport, thanks to its convenient carrying handle. Ideally sized cutting deck: the 20-inch cutting deck is perfect for all lawn dimensions. Although Black & Decker is one of the most popular tool manufacturers, many users complained about the poor customer support. Really compact and with a motor of only 8 Amp, this lawn mower from Earthwise is ideal for those with a small garden or for the ones who never used a lawn mower before. This tool fits well even in the narrowest spaces and it is lightweight, so it can be easily maneuverable on any type of terrain. The adjustable blade can cut the grass at heights that vary from 1.5 to 4 inches, while the adjustable handle is designed for better grip. Another great feature of this lawn mower is the 2-in-1 function of mulch or side discharge. Extremely compact: this lawn mower is designed for the narrowest spaces, being ideal for small gardens. Lightweight: weighing a little more than 36 pounds, this electric lawn mower is easy to maneuver and store. Quiet operation: thanks to its 8 Amp electric motor, this lawn mower boasts a quiet operation that will make mowing more pleasant. Little maintenance: in addition to the proper cleaning after the mowing, this tool needs little to no maintenance. Some users complained about the construction of this mower. Some of them experienced issues with the wheels, while others complained about the blade not being properly centered. This electric lawn mower from Sun Joe can be described with only one word: perfect. This lawn mower is ideal for small or medium-sized lawns, it is powerful, compact and can be converted from a regular lawn mower to a mulching mower by removing the collection bag and attaching the mulch plug. With its 17-inch cutting deck, the mower can be successfully used for narrow lawns as well, while the extra-lightweight tool can be easily handled on any type of terrain. The powerful blade is powered by a 13 Amp motor and can be adjusted to cut different types of grass. 7-height blade adjustments: the cutting position can be adjusted from 0.98 to 2.87 inches. In this way, you will be able to cut the grass at the desired height. Extra lightweight: this electric lawn mower weighs only 31.5 pounds and has an excellent maneuverability. The maneuverability is also enhanced by the sturdy wheels. 12-gallon collection bag: the mower comes with a 12-gallon rear collection bag that can be easily detached if you need to empty it or if you want to switch to mulch function. Safety switch: to ensure the safe operation, this mower features a convenient safety switch. Many users complained about the cheap construction of the mower and about the poor customer service. As our best electric lawn mower reviews show, there are a few valid options to choose from when it comes to buying an electric lawn mower. While the final decision will depend on many aspects, such as the size of your lawn, brand preference, and price, we believe that the best electric lawn mower available on the market is the GreenWorks 25012 12 Amp Corded 18-Inch Lawn Mower. We like this lawn mower because it has the perfect dimensions for almost all lawn sizes, its blade can be adjusted to cut through any type of grass, while the 7-inch frontand rear wheels and the low weight make this mower easily maneuverable. Versatile, this mower allows you to collect the cut grass using its side discharge function, or to transform the grass into natural fertilizer using the mulch function. Another big plus of this lawn mower is the 4-year warranty because you will have plenty of time to test and see the performance of this device and its durability in time. In addition to the long warranty, this lawn mower is also cost effective. It has an attractive purchase price and you will not have to worry about hidden costs, such as fuel or battery replacement. Yes, the manufacturer could give more clear instructions about how to use the electric cord of the mower, but this is not such a big issue. If you need any support, you can easily contact the customer service. The manufacturer could also add a safety button and a rear bagging function to the mower. Despite these minor issues, the excellent performance of this mower and its ideal dimensions make it the best electric lawn mower out there.